This Tile Insert shower/channel grate from Shower Grate Shop includes a tile tray so your tiles can be inserted providing an almost invisible linear drain. It's a favourite with architects and designers to achieve the coveted minimalist look. Its heavy duty high quality stainless steel offers superior load strength which is important in traffic areas. Available in lengths from 800mm to 1500mm. All these grates come with a 40mm centred drain outlet. 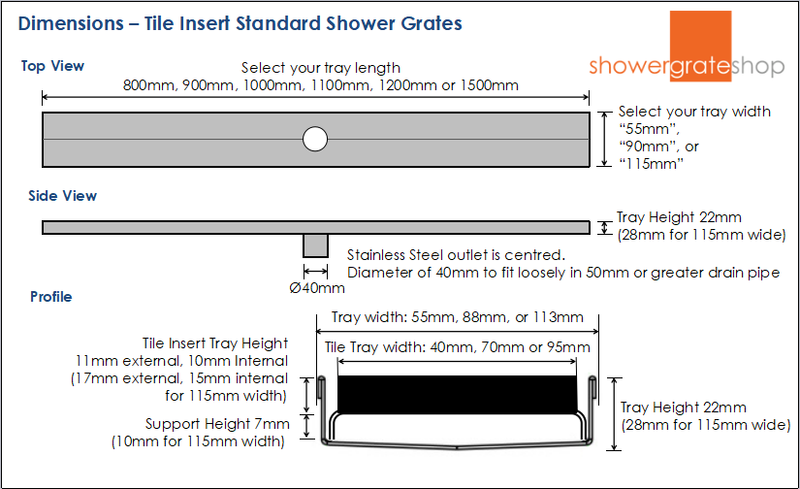 Our highest quality 100% 316 marine grade stainless steel shower grates have no plastic components and are manufactured in Australia to comply with ADA standards. 316 grade stainless steel has an increased ability to resist pitting and crevice corrosion in warm chloride environments when compared to the 304 grade. The manufacturer offers a lifetime guarantee. The Tile Insert shower grate/channel is ideal for complementing your choice of tile. Its minimalist design is easy to keep clean, not to mention really easy to integrate into whatever tile design you are going for. The only thing you can see is the stainless steel stripped openings after installation. We offer a variety of widths and lengths across all styles, and can even custom manufacture a grate to your requirements. This is very helpful option if you wish to design the grate to align with an existing drainhole. See our custom shower grates for more information. The modern recessed shower grate provides high quality styling to a contemporary bathroom. The benefits of a shower grate go beyond their superior looks - the installation of a shower grate is generally far simpler than a centre waste. Grading floor tiles to the grate's linear edge is far easier than the labour involved in grading, bedding, grouting and tiling around a centre waste. Taking labour into account, the shower grate is usually the more economical (and far more impressive looking) option.